Enlisting and starting your career in the military does not mean you must give up on your education. Military veterans and active duty personnel have opportunities for their long-term goals and career aspirations by taking online courses and obtaining a degree. The key is finding the right program to help you accomplish your goals while still keeping up with the orders you receive in the military. The benefits of returning to college after retiring from the military or working in the military depend on your goals and situation. If you are a veteran, then the benefits differ from the advantages of an active duty member of the military. Despite some variation in the advantages of the educational opportunities available to military personnel and veterans, there are some common benefits that apply in many situations. Getting a degree while in the military allows you to advance in your career. You can move up the ranks by developing specialized skills that the military needs in their officers. Military science degrees or related fields of study may open up doors of opportunity to advance in the military and take on more leadership roles. Veterans benefit from returning to college by developing a new routine. It helps you adjust to life as a civilian by interacting with your classmates and educators. You will have more chances to learn from civilians in college before you start working in a new field or career. That helps you adjust to civilian life without a learning curve after starting a new job. The obvious advantage of obtaining a degree and returning to school is the career opportunities. 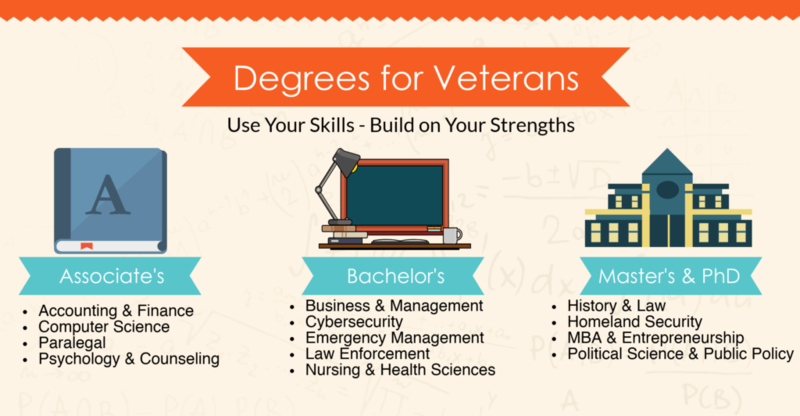 Active duty personnel and military veterans have more career opportunities as a civilian when they obtain a degree when compared to starting a career without a degree. The decision to obtain a degree online is a good choice for active duty personnel and military veterans. The reason it helps active duty personnel is the flexibility of the program. As a member of the military, you may need to deploy to a war zone or a new location at any time of the year. You will not always have enough warning to complete a semester at a traditional school. An online program addresses the challenges of working in a career that will require you to move. You can still take classes when you are deployed or sent to a new military base. Your classes and course work are not limited to a physical location. You only need an online connection to continue working on your studies. The best online colleges for active duty military and veterans offer courses that are more flexible for your schedule and situation. It allows you to continue your degree without interruption and it works around your situation. That helps when you are active duty and may need to move without warning. 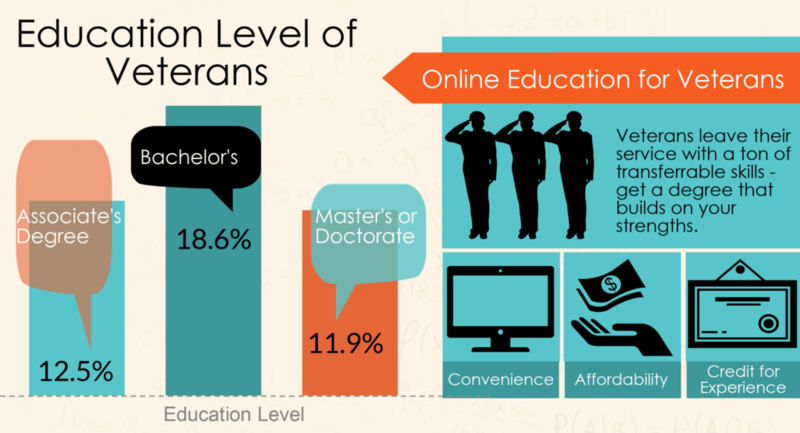 The best online colleges for veterans may also offer key advantages. As a veteran, you are not moving or facing deployment. That does not mean you are always ready to move into a traditional class environment. Military veterans face unique challenges when they return to school. You may feel uncomfortable with your classmates due to age differences. You may also want a little time to adjust to life as a civilian before you face a traditional class environment. An online program allows you the time to adjust to civilian life while you are still working on a degree program. What are the Best Degrees for Military Officers and Personnel? When you look at the best jobs after the military, you may find that you have limited opportunities. The challenge is finding the best degree programs for your career aspirations and that the VA approves for financial assistance. While you do want to make sure a college or university meets the standards set by the VA for accreditation (the best online colleges for veterans will make it clear), you still want to evaluate your options before you finalize your decisions. An online associate degree allows you to set up for higher education or start working in one of the best jobs after the military. You can specialize in a particular area of study or focus on general studies that will transfer into an undergraduate program. Paralegal: If you decide to specialize in a field of study, then you may consider an associate degree in legal studies. The degree allows you to work as a paralegal when you complete the program and allows you to prepare if you want to work in the legal field. Accounting and Finance: You can also consider a program in accounting or finance. The degree programs allow you to work under an accountant or work as a bookkeeper for small businesses. Since you can start in a civilian career without a long wait, it is a good choice while you pursue higher education. The best degrees for military personnel or veterans are not limited to associate degree programs. You can take a bachelor program online and complete your undergraduate education. The best online colleges for active duty military are the ones that build on the skills and knowledge you have already developed. Computer Science: Cybersecurity is an essential part of modern business and government, and an undergraduate program in computer science or computer network and cybersecurity may help set up your goals. The degree programs allow you to focus on specific areas of science and technology that can help with career advancement in the military, or after your service. Nursing: If you’ve worked as a field medic or some other area of military health, a degree in nursing can get you into one of the best jobs after the military. While you can become a nurse with an associate’s degree, most hospitals expect a Bachelor of Science in Nursing, so go straight for the BSN to make up for lost time. The best online masters programs for military personnel and their spouses allow you to focus on more advanced career opportunities. The best online colleges for military spouses and active duty members of the military recognize that you need flexibility in your education. An online masters program that focuses on flexibility and does not require you to attend traditional classes will help you advance in your military or post-military career. Criminal Justice and Security: Government and private security agencies offer some of the best jobs after the military, making use of your experience and skills in the civilian arena. If you want to work in criminal justice or security after your military career, then a masters degree in criminal justice will help with your goals. The degree program prepares you for a role as a police officer or to take on work in the FBI, one of the best jobs after the military. There are many specialized degrees in areas like Homeland Security, Emergency Management, and Law Enforcement that make extensive use of the skills learned in military service. MBA: If you plan to move into the corporate world after your military service, then you may benefit from an online MBA in business management. The program allows you to focus on learning business skills and business ethics. You will also have the chance to shift from military service into a corporate position. It also helps if you plan to start a new business after completing your service. An MBA is one of the best online masters programs for military veterans. Psychology: Psychology is another possible route that builds on military service, especially in areas like intelligence, forensics, and mental health. An online masters in psychology will allow you to prepare for work as a psychologist. In some situations, you will be able to work directly with a psychologist to provide treatment to veterans or military personnel. You can also work on psychology research with a focus on the psychological impact of military service on veterans. The decision to continue your education and obtain a PhD will allow you to transition into a career in your chosen field. It may also help you advance in your career as an officer in the military by providing a specialized service for the military. Some of the best jobs after the military may require a degree or a PhD, so you want to consider your goals after the military as well as your goals in the military when selecting a degree program. Criminal Justice: When you have an interest in criminal justice, then an online PhD in criminal justice may help with your career aspirations. The degree program will allow you to work in the FBI or a criminal justice career after completing your service. You can also apply the degree to your work in the military when you plan to work with the military police or you are working in the justice system for the military. Law: On a similar route, many military veterans and active-duty personnel can benefit from going into law. A law degree (a Juris Doctorate) usually only takes three years, and many law schools offer fully online programs. Attorney is one of the best jobs after the military, and can also be an asset if you’re planning a full military career. Research & Development: Military contracting is one of the biggest industries in the US, especially in technology. If you’ve gained strong technology skills during your service, research and development may be for you. A doctorate in areas like artificial intelligence, robotics, and other military-related technology helps you make a smooth transition into a civilian career. Are There Free Online Courses for Veterans/Active Duty Personnel? When you work in the military or retire from the military, you may find that you have a limited budget. That can make the idea of paying for college or a degree daunting. You may not want to take the financial risk in every situation. The best degrees for military officers are not free courses. While you can take free courses for certifications that apply to your field of study, most programs will have costs associated with the education. You can consider financial aid to help with the costs of an online degree program. The VA sets standards for active duty military personnel and military veterans who plan to return to school. A program must meet the VAs standards to qualify for some forms of financial assistance; however, the military does offer some aid to soldiers and veterans. The GI Bill allows active duty members of the military and qualifying veterans to obtain a degree. The costs covered by the GI Bill depend on the state and the college. It will help with the costs of your education and may pay for the majority of the expenses in some situations. You may also qualify for the Vocational Rehabilitation and Education program if you were injured while in the military and have certain medical complications associated with your injuries. The injuries must be a 20 percent disability rating or higher to qualify for aid. Active duty personnel and veterans can also use traditional sources of scholarships and grants to help with the costs of online education. Scholarships and grants may require you to write an essay or submit paperwork before you qualify for the aid. You may also need to maintain a set grade point average or complete other standards before you receive assistance. If you file the paperwork for FAFSA, then you may also request state and federal aid, as well as student loans. Active duty members of the military and veterans have a variety of opportunities for their career. You can obtain your degree while you work in the military through online courses. You can also wait until you finish your service and return to civilian life before you pursue your education. The advantage of a degree is that you can advance in your military career or prepare for a career as a civilian. The key is focusing on an area of study that interests you and will help with your career goals.